Hilarious series. Glad that it's here now. Amagi Brilliant Park is a super fun time series about saving a theme park from being shut down. It is a very hilarious series with enjoyable characters that can make you laugh. Each character is enjoyable in their own way, but it of course has some cliches. I personally found this series to be very colorful in it's animation and character designs. Unfortunately this series was not on Crunchyroll when it initially released, but it's great to have it on here now. I highly recommend this series to those enjoy having a good laugh. Ready for some Magic Hour? Amagi Brilliant Park is many things. It's hilarious, with great characters and a well paced story. If you look at the title and the cover art for this show, you'd never guess that this show would be as great as it is. The animation and art style are gorgeous, with great use of color, smooth transitions and beautiful scenery, every episode. It's an Anime filled with funny, memorable and meme-able moments, an interesting plot, filled with suspense and mystery, all while having a hilarious and original cast of loveable characters. This show also manages to be refreshingly original and adult in all the best and funniest of ways, you'll laugh, you'll wonder and most of all, you'll wish that this place existed. Japan, make this place! I watched the first three episodes last night before they took it down (lol), but I really liked it!! Its something totally different of what I've watched and just by watching the first three, I know its an awesome series!!!! Hopefully Crunchyroll updates and posts all the videos!! So glad this is on CR! I was a bit reluctant to watch this series, but after watching the first episode, I was totally hooked. I found myself waiting for the weekly releases(I stumbled upon it episode 7), it has very well designed characters and a very distinct main objective for them all to achieve. Sento Isuzu definitely scores high in my kuudere beauties list. Comical anime with a heartwarming tale! I enjoyed watching this so much! I am glad crunchyroll finally added this title into it's regime of epic animes. This is a fun show with a simple yet very cute story where boy meets girl and girl then recruits boy to save help save everything she loves! Please note:This anime isn't for kids. The premise is different, the characters are wacky & lovable, & each episode was funnier than the one before. I ended up watching the entire series in one night. They could have gone crazy with the fan service in this series, but they kept it to a respectable amount, which was nice. I can only hope there will be a 2nd season. The character designs are colorful and brimming with personality. It also has a stable of very memorable male characters, although the female characters definitely hold their own. The story is built up bit by bit, but you'll most likely continue watching for the humor and crazy antics while occasionally glancing at the story as it goes by. It's also got one of the catchiest openings that I've seen. 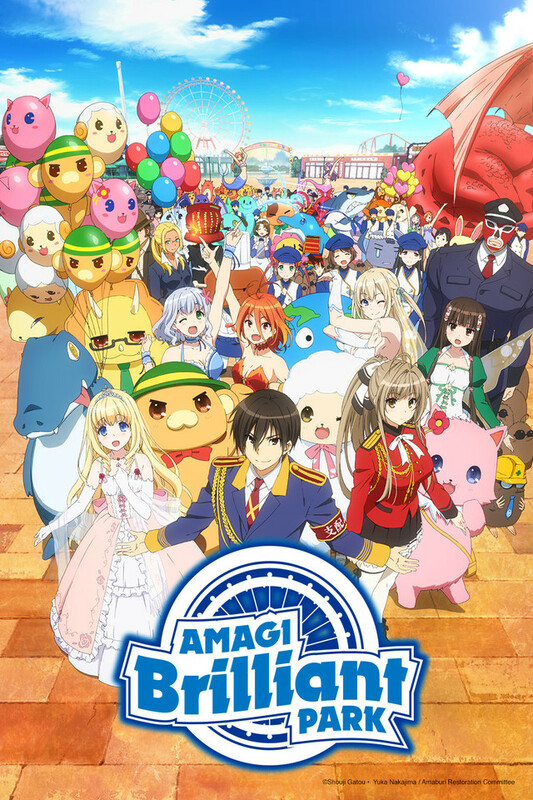 If you're in the mood for a light series and a few laughs, definitely give Amagi Brilliant Park a try. This show is really good. It's got humor, music, romance, gorgeous art, and fantastic voice acting. It is a feel good kind of show and it lifted my mood greatly. Just watch it and chances are you will be a happier person, at least for the day you watch it. Life is good! Amagi brilliant park has a very unconventional cast of supporting characters that originally had me being quite skeptical. However, those skeptical feelings jumped out the window the more i watched. I laughed my way through the series and never looked back, and I found myself singing with the opening every time. If you are expecting the many mascots of Amagi brilliant park to be normal mascots, you will be sorely mistaken. They are some of the most expressive and strange charters i have seen period, in a good way of course. They have some of the best facial expressions i have seen in any anime. Needles to say Amagi has a very good supporting cast with comedic interactions throughout. I was also very pleasantly surprised at some of the female characters who seemed to have many real conversations both with the main character, the Elementario characters to be specific, without being, at least as far as i could tell, romantically interested in him. Kanei has a bit of an overused character type being the know it all perfect person. However he does make quite a few major mistakes throughout the series to remind you that even if he thinks he is perfect he can still mess up. The story isn't too original with a high school student swooping in to save the day but the comedy is fresh and makes this overused topic forgivable. Sento can get a bit emotionless and violent at times but most, not all, of her violence is directed at the mascots, some is saved for Kanei, and it can add a bit of comedy to strange situations. This is a must watch for comedy lovers or those who like it when a cold main character gradually change over a series. I give it a full 5 out of 5. Also fun fact many of the main characters were named after american rap and pop stars like 50 cent for sento isuzu, queen Latifah for princess Latifah , and so on and so forth. Also Bonta-kun from Full metal Panic is here, and the two are nothing alike. - What isn't to love about this series? The blend of comedy and storytelling is very well done. On the outside it may not look it, but this series is a little deep at times. - Every single character is fun to watch, and that in and of itself is a very rare accomplishment. Often times shows have decent support with an emphasis on the main cast, but it is not as visible this time around. It feels like most characters were utilized well, will weaker characters not getting as much time to keep from wearing thin. - The ending was good, a little on the dues ex machina abuse, but that did not hinder the ending of enjoyment. - On a personal note, I think I liked Isuzu more than I should have. - A lot of the characters that received little screen time seemed like characters that could have used a little more recognition. Wrench-kun (his name believe it or not) is one who I enjoyed alot when he was on screen, but he never really gets the spotlight. Maybe it's for the best, since his character is not fleshed out as much as the rest, but I wished they gave him more time. Amagi Brilliant Park in the nutshell; This has earned the spot of being my favorite anime to date, and considering it is a very new series, that is an accomplishment.